The first greenhouses appeared in ancient Roman history, when gardeners grew cucumbers for Emperor Tiberius in buildings made with mica panels to let light in and heated with decomposing manure. Today, the most common type of hobby greenhouse is made of sturdy polyethylene plastic with a framework made of PVC plastic tubing. Although these greenhouses are inexpensive and quick to assemble, they begin to break down after only a few years. Fortunately, it is as easy to restore a greenhouse as it is to build one. Assess the extent of damage to your greenhouse. An older greenhouse made with PVC pipe may have cracked, split or broken framework or punctured and torn greenhouse plastic. If just a few PVC pipes are broken, you may wish to only replace those. But if all of the pipes are brittle, you may desire to replace them all at once rather than wait until they break as well. Similarly, if the plastic is not torn badly, you can repair it with patchbond greenhouse tape. If the plastic is torn beyond repair, you may want to replace it completely with new greenhouse plastic. Measure the length of the PVC frame pieces with a tape measure. Purchase UV-resistant gray PVC conduit to replace the PVC pipe. Pull PVC plastic off the frame and remove PVC pipe from the framework. Cut conduit to the same size as the PVC pipe with a hacksaw and fit it into place. 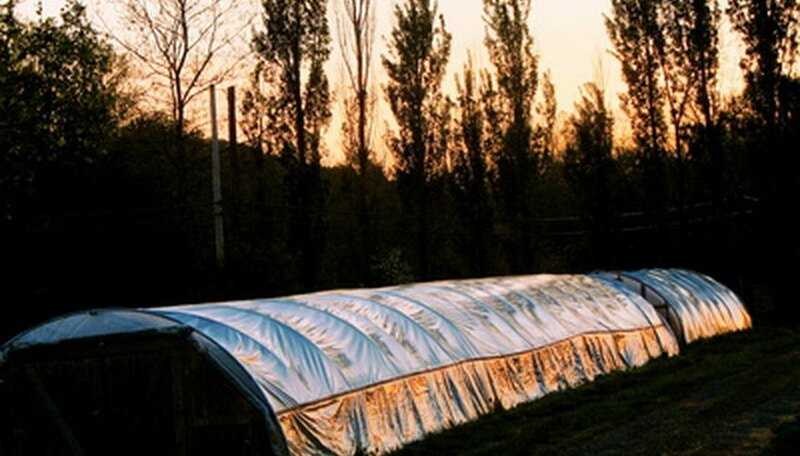 For a hoop house, slip one end of the conduit over a rebar that has been driven into the ground. Then flex the conduit into a U-shape, and place the other end of the conduit over a piece of rebar on the other side of the greenhouse. For a square greenhouse, slip the conduit into the pipe fittings to replace the missing PVC pipe. Paint the entire PVC frame using latex paint and a paintbrush to make it more resistant to UV rays. Stretch new greenhouse plastic over the frame and staple into place with a staple gun and staples. Mend old greenhouse plastic by washing both the inner and outer sides of the greenhouse plastic. Cut two pieces of greenhouse plastic to a size that will completely cover the hole in the greenhouse plastic skin. Affix double-sided patchbond greenhouse tape to one side of each patch. Roll the tape onto the patch to remove all air bubbles. Remove the tape backing from one patch and press it onto the outside of the greenhouse over the tear in the liner. Remove the tape backing from the other patch and press it to the inside of the tear so that the tear is sandwiched between the two patches.